Route 66 in Arizona is as colorful a stretch of the old Mother Road as can be found anywhere. It is a land of volcanoes, meteor craters, petrified forests and cool pine forests. Route 66 was the gateway to the Grand Canyon State and adventure. 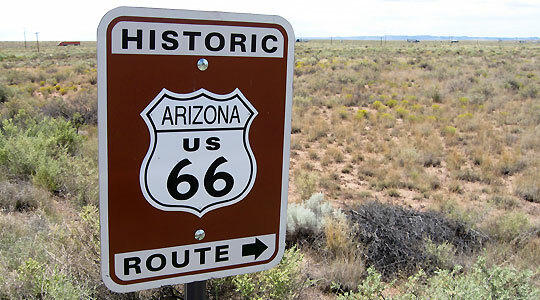 In 1926, some 400 miles of Route 66 passed through Arizona, but very little of it was paved. That changed in 1933, and it was finally completed in 1938. Arizona was a tourist’s paradise. The Grand Canyon, and Painted Desert, not to mention the romance of Indian Country and the Old West attracted visitors from all over the world. The Santa Fe Railroad launched an extensive campaign at the turn of the century to lure tourists out to the wild west and mingle with the local cowboys and Indians.